Power Resume Search allows clients to use web services that allow their systems to call into Monster databases to semantically search job seeker resumes and to save retrieved resumes locally. Below is a flowchart that shows the steps and calls that take place between Monster and the clients system. Client will be responsible for making the calls, in the sequence suggested in this guide, to Monster in order to successfully implement Power Resume Search. Within some sections there is a list of key points that clients need to be aware of and consider during development. A resume query goes against Monster's PRSX server. Resume retrieval is done against Monster's BGW. The client's implementation should support multiple CAT's. Resume query results provide a resume preview which is used to determine whether to download a seeker's complete resume. Retrieving a resume, every time it is retrieved, will decrement the resume view inventory. Monster does not track whether a resume has previously been downloaded, so client needs to track that to avoid using up inventory. Resume inventory levels can be retrieved by using the queries described at: https://partner.monster.com/inventory-query-guide. It is strongly recommended that this information be presented to the recruiter such that they are aware of their available inventory. It is recommended that clients only allow searches based on the type of license(s) available for a recruiter. Client is responsible for all EEO and OFCCP recordkeeping, reporting and processes that may be required pursuant to their use of Monster's resume database. EEO letters cannot be generated through the Power Resume Search. The assumption is that the partner's system, which is integrated with Monster, becomes the end customer's system of record and all EEO / OFCCP data should be stored on the client system. Additionally, since the sourced resume is not stored on Monster in association with the customer, Monster has no provision to record the relevant EEO / OFCCP snapshot data for that interaction. This is an optional step, highly recommended, to obtain current inventory levels of the recruiter's account. Details on how to create this query can be found at: https://partner.monster.com/inventory-query-guide. Inventory query request samples can be found at: http://integrations.monster.com/MonsterWebServiceToolkit. Once at this URL, select "InventoriesQueries" under "select XML type". 2. Monster provides Inventory Query response. This step only applies if the optional step 1 is performed. A response to the inventory query is provided in Monster's standard XML format. The response includes information such as the types of licenses available, the quantity of inventory for each type of license, the locations of the resume view inventory, etc. This information should be presented to the user such that they know their available inventory. Also this information should be used to limit the searches allowed by that user in the client's interface to avoid failures in retrieving resumes for lack of inventory. 3. CLIENT creates and invokes resume search query (request). 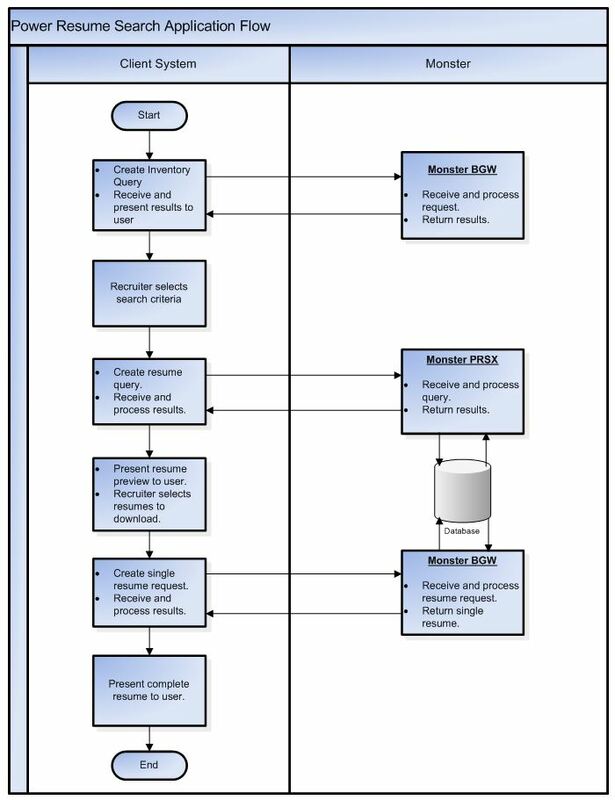 This is the SEMANTIC search part of the process. Power Resume Search PARAMETERS are located here. 4. Monster provides resume search query response. This step provides summaries of the resumes and seekers. A response to the power resume search query is provided in Monster's standard XML format. The response includes the amount of resumes found based on the query criteria, the job seeker's ID and a preview. From here, the recruiter should then decide which resumes are of interest and would like to retrieve the complete job seeker resume and contact in for. This step is where the full resume and profile data for the seeker is retrieved. The body information can be found at: https://schemas.monster.com/current/xsd/query.xsd i. Requires the resume seeker ID ("Resume SID" from the PRSX response). This value is referred to as "textResumeId" in the request. Resumes can only be retrieved one at a time. Attempting to retrieve multiple resumes at a time will cause “Transport https does not allow payload”errors. Therefore, don’t use the <Queries> tag in the XML. The <StoreRenderedTextResume> element of the XML provides the option to receive the <TextResume> element in the response file populated for resumes created using Monster’s resume builder. This element, along with <ResumeRestriction>, is optional and defaults to false if not included in the request. CLIENT receives resume from Monster. 6. CLIENT receives resume from Monster. Client needs to be able to parse this information such that it can be displayed appropriately to the recruiter. For troubleshooting purposes, it is highly recommended that the response XML be at least temporarily stored by the client for troubleshooting purposes. The element of the XML provides the option to receive the element in the response file for resumes created using Monster's resume builder. This element, along with , is optional and defaults to false if not included in the request. Resume view inventory is used up EACH and EVERY time a request is made to the Monster BGW for any resume. If a resume is downloaded via the Monster BGW, 1 unit of resume view inventory used. If that same resume is downloaded again by that same user, via the Monster BGW, an additional unit of inventory is used. If that resume hasn't changed, an additional unit of inventory used. If that resume has changed, an additional unit of inventory used. POST inventories query request to https://gateway.monster.com:8443/bgwBroker to obtain resume inventory levels. Receive response XML and display the results to user. Receive response XML and display resume search results. POST resume retrieval request to https://gateway.monster.com:8443/bgwBroker for resume of interest. Receive response XML and display to user.